Another Long Walk: Day 2: The Long Boatride to Casa Blanca! March 16: Amanda slept in late, which was okay since we had no set plans for the day and it was Amanda's birthday. Whatever she wanted, that's what we'd be doing. We ate breakfast at our casa particular, which included a fruit smoothie, bread (with butter and jam), more fruit, and eggs. Amanda got tea while I settled for water. Then we were off! We hoofed it over to the waterfront because, hey! Waterfront! We followed 23rd Ave down to the coast where waves crashed dramatically high above the sea wall. Amanda then led us a bit inland where we walked through an bustling area of town where the buildings looked like they were crumbling apart and rather depressed. I pointed out a dead chicken in one of the gutters and commented to Amanda, "I bet that chicken tried to cross the road." She laughed--but only because it was probably true. The streets were busy with cars that wouldn't even be legal in the United States, and the sidewalks were rutted and falling apart and, at times, barely usable. Deeper into town, the buildings looked better maintained, although I'm not sure I'd want to take my chances in any of them during an earthquake. The first major stop Amanda wanted to make was at the Plaza Hotel because she had an old photo of her dad when he was just 15 months old on the rooftop garden of the Plaza Hotel. We had no idea if there was still a rooftop garden or if we could identify the location of the photo. It was quite likely a lot had changed since the photo was taken in 1937--80 years ago. We took an elevator to the fifth floor--the highest that the elevator would go--and there was a restaurant located there according to the sign on the elevator, but we weren't sure if that was the actual rooftop or if there was another level for the roof above the 5th floor. The restaurant was inside, and not currently open for business at the moment but nobody stopped us from entering it. The restaurant had an outdoor terrace which we stepped out on and wondered.... was this where the photo was taken? The photo included an arch in the background, a square column and a terra-cotta roof, and the area looked like might be a match except that there was no arch to be seen. Amanda follows in her father's steps.... 80 years later! We followed a narrow corridor to a patio with chairs for people to lounge in the sun and admired the commanding views, but nothing matched what we saw in the background of the photo. We continued our circuit around the rooftop, then did it a second time but came up empty-handed. Wherever this photo was taken on the roof, there were no arches anywhere. The area that looked most similar to the photo was on the outside deck of the restaurant which did have the terra-cotta roof and square column, but alas, no arch. Amanda thought that maybe the arch had been squared off at some point since there were square openings, but my gut feeling was that the inside dining area of the restaurant had been expanded at some point and the arch was filled in and turned into a wall. We had no way to check if either of our guesses were correct, however. We took a few photos anyhow, then headed back down to the lobby where we noticed a few historic photographs of the hotel. The earliest photo showed the hotel with just two stories. About 15 years later, the hotel appeared with four stories. It had grown in size! There didn't appear to be anything making up the 5th floor, although there could have been a structure out of view from the ground level. It gave my theory that the arch and been filled in and turned into a wall later some credibility, but it was hardly a smoking gun either. Back outside, we drifted near the waterfront again admiring the sights and sounds of Cuba. Taxis drove by, honking their horns to get our attention hoping to give us a ride. Women dressed in fancy, colorful clothes posed for photos (for a fee, of course!) Tourists wandered around everywhere. I heard a surprisingly large number of American accents. We definitely weren't the only Americans in town. Eventually we ended up at the ferry terminal where we waited for a boat to whisk us away to the exotic Casa Blanca. I joked to Amanda that we could brag about going to Casa Blanca and most people would probably assume that meant we were in Morocco rather than a part of Cuba. We wouldn't have to correct such an assumption, would we? The ferry didn't have any seats--it was standing room only but the ride only lasted a few minutes to get us to the other side of Havana Harbor. I knew the USS Maine sank somewhere around these waters but wasn't sure of the exact location of the infamous incident that led the United States into a war with Spain. With the lack of Internet, it might be awhile before I could look that up. It might be an interesting place to visit. Standing room only in the ferry! We also passed some retired military armaments on display such as old planes and rockets, but the wreckage of a US spy plane was the display that Amanda and I found most interesting. It was--according to a posted sign nearby--the wreckage of a U2 shot down in eastern Cuba. I had no reason to doubt the authenticity of the information on the message, but at the same time, I took everything I read about the United States or Castro's revolution with a grain of salt. This is a dictatorship, after all, and there's no such thing as a free press. Undoubtedly anything critical of the local government has been scrubbed from all informational signs and if there's a bad guy to be promoted, it's likely the US government. To be fair, the US government hasn't exactly been blame-free as tensions between Cuba and the United States escalated--but I doubted that there would be a fair and honest assessment of the story in Cuba. 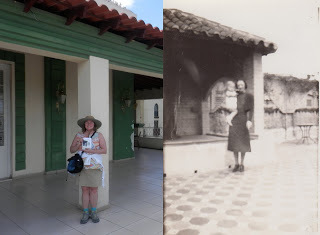 Eventually we reached Castillo del Morro where Amanda had two more photos of her dad as a baby. In both photos, we knew they were taken at the Castillo del Morro because there were signs in the background that read "View of Havana from Castillo del Morro." Written in English, no less! If those signs were still around, they'd be obvious landmarks, and we circled the place but found no evidence of them. Clearly, we had to take a closer look at the photos. The first photo included the lighthouse. Three windows were visible along the side of the lighthouse and with a door open at the top. A flag pole ran up the side of the lighthouse. There was a flagpole, but it was located near an adjacent building and no longer on the lighthouse, and I couldn't see any evidence of the brackets that held the flagpole in place. The only thing in the photo that gave us a good sense of where the photo was taken from was the door at the top. As best we could tell, there was only one door at the top, just to the left of the center of the lighthouse in the photo. We had to find the vantage point of the lighthouse where the door would be at that location. We found it quickly and all of the other landmarks in the photo lined up perfectly. We found exactly where this photo was taken! In the photo, the people were standing in front of a wooden fence that was no longer there, and although we had the right general area, I spent several minutes studying the tiniest details of the photo trying to figure out, to the best of my abilities, the exact point where the photo was taken. The third window in the lighthouse was partially obscured by a short wall, so I moved to a location where the wall obscured the window in the same manner. A wall on the left side of the lighthouse poked out, almost directly towards the camera, so I moved to the left to make that piece fit. Perhaps I wasn't at the exact point where the photo was taken, but I'd bet I was within five feet of it. It all fit so perfectly--even 80 years later! 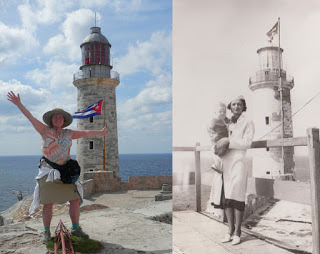 Recreating the photo of Amanda's dad at the lighthouse... 80 years later! I positioned Amanda in the same location as Margaret was in Amanda's photo. Amanda doesn't know who Margaret is--presumably a friend of her grandmother since she's holding Amanda's dad in the photo. And I snapped a few photos trying to recreate the photo as best as we could. After this photo, we headed to the lighthouse to climb to the top because... why not?! The steps spiraled upwards. At first they were wide and easy to navigate, but at each level, the staircase got a little bit narrower and the ceiling a little bit lower. The last stage up, I swear, must have been meant for midgets. I had a devil of a time getting through as I crouched low and my small backpack scraped the ceiling of the staircase. The guy at the top wouldn't let us walk out on the outdoor railing which disappointed me. Maybe it was too old and dilapidated to allow people to walk on now? But we could look out the door to take photos and admire the lens inside the lighthouse. Going back down the staircase proved to be even more difficult for me than going up. At least my pack wasn't scraping against the ceiling anymore, but my thighs burned with each long step down. I had to lean back a bit while going down the staircase because the ceiling was so low and wow--it was maybe 20 steps, but my thighs were burning after those 20 steps. I was seriously sore--and would be for several days! Amanda came out of it saying that she wasn't really all that sore. I think my leaning back a bit while descending the steps made the difference. My leg muscles had never had to do anything like that before! 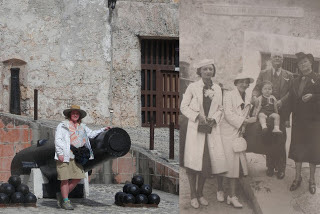 The next photo we tried to recreate was one where Amanda's dad was sitting on the turret of a cannon with four adults (including her grandmother) standing on either side of it. There were a lot of clues in this photo. The two adults on the right were standing on a slope heading upwards towards a large door with a grate then curved behind them to the left. Barely visible on the left side of the photo was what--at first look--I thought was a window but was actually a cannon facing straight up in a recess of the wall. It reminded us a lot of the slope where Amanda and I had first entered the fort and went up towards the lighthouse. And it was a total match. Everything matched up nearly perfectly. The cannon even looked the same, but it had clearly been moved a few feet away from the slope at some point during the last 80 years. I tried to align my camera as closely as I could to the photo we had. Click! Another photo checked off. We had one more photo, but except for the sign behind it saying that there was a view of Havana from Morro Castle (which obviously was no longer around), there was absolutely nothing else in the background to help figure out where the photo was taken. It could have been taken anywhere at the castle. The background was just too generic to even take a guess at its location. We failed finding the point where that photo was taken. But still, out of four photos during the way, we definitely found the locations where two of them were taken 80 years later. Not bad! By now, we were both ready to eat and walked down to a restaurant by the water. A lovely place to sit and enjoy the view of Havana! We ordered food, Amanda ordered a beer to wash it down with, and I ordered a Coke. Or tried to. It was on the menu, but they told me that they had no Coca-Cola despite it being on the menu. To be fair, I remember hearing that Coke generally wasn't available in Cuba due to the embargo and all, but I figured that didn't mean there was no Coke in all of Cuba. All you need is one person to bring in a bottle from Mexico and presto! There would be Coke on the island! So seeing Coke on the menu didn't surprise me, but I was a little disappointed they didn't have it available. And I liked it. But there was a twang of something in it that I thought had a faint taste of alcohol. The drink wasn't supposed to be alcoholic, but I wondered if they might have included a small spot of rum or something to give it more kick. If they did, it didn't show up on the list of ingredients. But I liked it, and later ordered another one. TuKola--the Cuban equivalent of Coca-Cola. By now, Amanda was tired of walking. I was inclined to walk back to our casa particular, and while Amanda offered to walk back to the ferry terminal, I knew it was only a matter of time before she insisted on a taxi the rest of the way back. We walked up to where all the taxis were hanging out and I discussed strategies with Amanda. She'd done more research about how much stuff should cost. "How much should we expect to pay for a taxi from here to the hotel?" I asked her. But Amanda wasn't entirely sure. It was supposed to be $3 from the city center to the hotel, but we weren't at the city center anymore. She guessed that maybe it would be $5 or $6. "And what's our maximum price we'd be willing to pay for a taxi ride?" I asked her. "Ten dollars," she answered. That left a little wiggle-room in case she was wrong about how much it would normally cost for that distance. Just as we finished discussing the issue, a taxi drove down the road and asked if we needed a ride. It was a hot, pink convertible car that looked like it might fall into 3,000 pieces if you kicked a tire, but it certainly had character! "Si!" I answered, in Spanish. "Cuantos a...." I wasn't sure what to the tell the driver about where we were going. I turned to Amanda. "What's the name of that hotel you wanted to check out?" "Cuantos a Hotel Nacional?" I asked the taxi driver. How much to the Hotel Nacional? "Quince," he answered. Fifteen dollars. Amanda just turned around and started walking away. Awesome. I liked the flair. The dramatic, are you kidding me?! moment of stalking off. The taxi driver waved me back. "Wait!" he said, in English this time. "Twelve?" I pretended to not be sure. I wanted to string the taxi driver along. Pretend I was interested, but still a little concerned about the cost. Amanda turned around to see what was going on and I told her, "He's offering $12 now. Interested?" I knew what her answer would be--absolutely not. We were clever and had already worked out what we would settle for. I was sure the taxi driver would lower his price again when Amanda stalked off again. But Amanda surprised me and said, "Okay," and nodded her head agreeably. What?! It was all of 10 seconds earlier that we had agreed to negotiate down to no more than $10, and she just settled for $12?! She was supposed to be playing hard-to-get! What happened to our plan? Now that Amanda had caved, I reluctantly went along. I should have never asked Amanda if she was okay with $12. I had done it hoping to show the taxi driver that we were interested... string him along... but only at the right price. I hadn't expected Amanda to actually agree to it, though! She was supposed to be insulted by the offer like she was the first time around! Our taxi back to town! Amanda climbed into the back seat and I decided to sit in the front which seemed to confuse the taxi driver. "You don't want to sit together?" he asked. Well... we weren't going far, and the front seat looked more comfortable. I'd have let Amanda sit in the front if she wanted it. The car had no seat belts--I looked. It seemed like a prudent thing for this wreck of a vehicle. And it was a convertible for goodness sake! If this car crashed, I'd easy be thrown from the vehicle and land on my head 50 feet away. The car took off and I grew even more concerned as the man seemed to think the line in the center of the road was meant to be straddled rather than separate us from oncoming traffic. I saw an oncoming car heading towards us and looked around for something to brace myself for the oncoming impact but found nothing to hold on to. Fortunately, the driver veered back into his own lane at the last moment and the other vehicle passed without trouble. Then he started veering back onto the center line. I hoped we weren't about to die. The taxi drove us into a tunnel that led under the opening for Havana Bay then exited the other side, following the scenic shoreline and miraculously not getting us in a wreck. My life flashed five different times before my eyes during that 10 minute drive, but the icing on the cake was when the driver went to shift gears and the knob on the gear shift fell off by my feet. He tried to reach down to get it but couldn't quite reach it, and pointed asking for me to reach it. I picked it up and handed it over. He put it back on and changed gears like this was a normal event. All part of the service! Miraculously, we arrived at the Hotel Nacional without getting killed. I paid the 12 CUCs and the taxi drove off. I turned to Amanda. "I thought we agreed to a $10 limit!" I said. "What happened?! You were supposed to tell the taxi driver no when I asked if $12 was okay!" It turns out, the first offer the guy made--when he suggested 15 for the fare--Amanda had thought he said 50. (Cinquenta, rather than quince.) When she stalked off, she wasn't just acting. She really was insulted thinking that he was trying to rip us off for $50! When he came back and offered $12, she thought that was so reasonable she agreed. "And anyhow," she told me, "that applied to regular taxis. Not the old classic cars." We were in an old classic car? Well, I'd agree with old. I'm not so sure about the classic part. "But we had a plan!" I told her about my shock when she agreed to $12, which she seemed to think hilarious. "We need to work out our plans better next time," I told her. "I think he would have lowered his price some more." We toured around the Hotel Nacional--one of the fanciest hotels in the area and a tourist trap in its own right before heading to the street and walking back towards our casa particular. Along the way, Amanda wanted to stop at the Havana Libre. At 25 stories tall, it's among one of the tallest buildings in Havana and was inaugurated as the Havana Hilton in 1958. Just one year later, after the Cuban revolution took control, it was renamed the Havana Libre and a suite on the 23rd floor was used as the Revolutionary Headquarters for a few months. Later, the first Soviet embassy used two floors. There's a lot of history in this building! Amanda wanted to check it out, and there was allegedly a restaurant on the 25th floor with spectacular views of the city. We took the elevator up and sure enough, there was a restaurant with fabulous views from the top just as the sun was about to set. We looked at the menu and weren't particularly surprised to see that the prices were a little... well, pricey. The views, frankly, were worth the price alone, but we decided to linger and get a couple of drinks instead for the next hour or so. The waiter asked for our drink orders, and now that I was familiar with the local cola, I asked for a TuKola. The waiter shook his head saying that they didn't have that, but that I could get a Coke. The sun set and darkness fell. Lights twinkled across the city. I sipped my Mexican Coca-Cola while Amanda imbibed an alcoholic beverage. It was a good place to be! But it was also time to head back to our home for the night. That's the Hotel Nacional in the background. Most of the fountains we passed had no water in them. I'm not sure if that's temporary or the country is just too poor to maintain their fountains, but they were usually empty. This must be the bad part of town. I definitely wouldn't want to be around here in a big earthquake! The Hotel Plaza has great views from the top! There were archeological digs going on here uncovering more than 500 years of Havana history! Not sure what this guy is doing. Filling up one bottle of gas from another bottle? But neither of them are going into the gas tank! Jesus Christ! That's a big statue! Parts of a U2 spy plane shot down in eastern Cuba. Narrow and steep passages in the castle! The Habana Libre--where we'll watch the sun set from the 25th floor!